I need to focus on research for the next couple of months, so blogging will likely be much less frequent for a while. I'm not closing down, but I am scaling back - probably only a post a week or so. In the meanwhile, here's a picture of the Billboard for Anders Bookstore, which is just at the edge of the Auburn campus. Smart marketing. 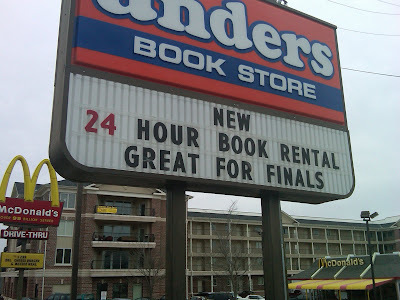 For any students reading - good luck with finals - if you're at Auburn, consider a longer rental term. For all the faculty - good luck writing (and grading) them and wrapping up the semester.